Plans to build an underground rail system in Warsaw date as far back as 1918, when the idea was first floated in reaction to Warsaw regaining its status as Poland's capital city. An underground railway system was expected to solve the transport difficulties of the densely-built city centre. Proper preliminary planning and boring work were initiated by the Warsaw Tramway Authority in 1925, with construction expected to start in the late 1920s. The Great Depression buried those plans as Poland and the world was gripped by hardship. In 1934, with the election of a new mayor of Warsaw, Stefan Starzyński, work was to resume on the metro. The mayor dusted off the plans from the mid-1920s, and with some minor adjustments, construction of the metro was planned to start by the late 1930s, with a projected finishing date of the first of two projected lines scheduled for the mid 1940s. By then, the subway network was to consist of two lines. The A line (North-South line, 7,5 km or 4,6 mi long), followed most of today's route and was to link the southernmost borough of Mokotów with the city centre and the northern borough of Żoliborz. This line was to be connected with the newly-constructed Warszawa Główna train station and the railway tunnel crossing the city from west to the east. The B line (East-West, 6,3 km or 4 mi long) was to start beneath the westernmost borough of Wola, proceed along the Chłodna street to the pivotal station beneath the Saxon Sq. and then further eastwards to the Vistula river escarpment. There, the line was to go overground, cross the river through a newly-built bridge and proceed to the easternmost railway station of Warszawa Wschodnia. Altogether, in 35 years 7 lines were to be built). The works finally started in 1938, but World War II brought an end to the ambitious undertaking. The short trace tunnels made in 1938 serve as a wine cellar today. The city suffered heavily during the war. It was damaged during the siege in 1939 and in 1943 the northern part of downtown Warsaw was razed to the ground following the Warsaw Ghetto Uprising. Finally, after the Warsaw Uprising of 1944 up to 90% of the buildings on the left bank of the Vistula were reduced to ruin by the Germans. The population returned to the city in 1945 and came upon sheer devastation. However, reconstruction of Warsaw started almost immediately. Although the majority of pre-war projects perished during the Uprising, most of the engineers behind their creation survived the war and returned to their city to take part in its rebirth. However, the new Communist authorities of Poland envisioned a city completely different from what it used to be before the war. As the ideal communist city, Warsaw was to be decentralized and a need to commute to the city centre was to be reduced. Thus the Reconstruction of Warsaw Office (BOS) commissioned a number of engineers to prepare a project of a fast tramway (Fast Urban Railway, SKM) crossing the city in a deep cutting. Although to a large extent it was to follow the A line of the pre-war plans, only the central stations were to be located underground. However, by the end of the decade the project was cancelled. Instead, in 1948 a different concept was considered. This time the SKM was to be a rapid transit line at a depth of up to 15 metres (50 feet). The suggested North-South direction, with three parallel branches of the same line in the city centre, corresponded to the planned development of the city along the Vistula. The works however never started and this project was also cancelled. In the 1950s, as the Cold War raged on, Soviet strategic plans required that a secure transport link across the river Vistula be built. One of the ways to achieve this was to create a deep metro system in Warsaw (up to 46 metres or 150 feet beneath the ground), which would be interlinked with the rail network and could serve as an underground conduit for transporting troops. Plans assumed that the first line (ca. 11 kilometres or 7 miles) would lie along North-South axis, with a branch of the same line crossing the Vistula river in the city centre. The construction works started almost simultaneously at 17 different points on both sides of the river. Until 1953 771 metres of tunnels were built, however after the death of Joseph Stalin and the start of a period of détente, all works were halted under the pretext of technical difficulties. In following years only one junction tunnel and one shield-driven tunnel were continued to be constructed. These works were undertaken experimentally, in order to discover the best driving methods suitable for the ground conditions beneath Warsaw (pliocene clay formations layer spread beneath quaternary soils). Finally, in 1957 all works were halted. Since 1955 there was a return to the old idea of a shallow metro network. However, the planning phase proceeded at a very slow pace and the proceeding economical crisis prevented all successive communist governments from actually starting a serious work. Finally, in 1984, the programme was approved by the Communist government and the first tunnels were built. Lack of funds, poor planning, and tedious bureaucracy meant that the work went forward very slowly, at a speed no greater than 2 metres a day. 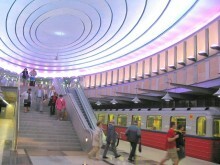 The Metro was opened in 1995 with a total of 11 stations. The line now has 16 stations along a distance of approximately 15 kilometres, and will be completed with a total of 21 stations by early 2008. Perhaps alone among world metro systems, tickets are not available from the transport company itself, but from private-run kiosks; however, the ticket system is valid for all Warsaw public transportation, including the Metro, buses, trams and some suburban trains. Because of that the tickets can be obtained in any of the hundreds of kiosks located across the city, in addition to post offices, transportation offices and some shops. Besides, all stations have a kiosk located not more than 5 metres from an entrance. In addition to tickets, one can also purchase a proximity card at certain kiosks or post offices which can be charged for up to 3 months at a time. As a result, they are much cheaper than purchasing tickets daily. Another interesting feature of the Warsaw Metro is that the southern stations (Kabaty - Wierzbno) serve as a bomb and atomic shelter: all stations are guarded by massive gates. 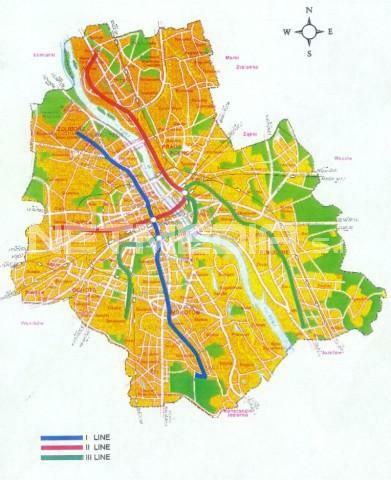 The second line, crossing the city from east to west (heading north from central Praga on the east bank of the river) is planned, along with a short third line from central Praga going south; both of these are truncated versions of earlier plans for the lines to approach the city limits at each end. Construction has not yet commenced and is unlikely to start before the first line is completed. However, plans for the beginning of construction of the second line ("the first stage", from Dw. Wileński to Rondo Daszyńskiego) are currently being put at 2007, with its finishing being put at 2011. However this is considered to be too far an optimistic target, with the others putting the opening of this section only at 2014. The first line was a compromise between earlier route proposals further east and west (one of which belonged to the planned Line 4) and as such does not go to some important areas of the city. For example, it does not pass directly under the old town, Warsaw's main tourist attraction, which has few public transport links, passing it about 600 m to the west. It also does not go to the central railway station, and the nearest stop is over 400 m to the east (the planned second line will also avoid it, with the closest station also about 400 m to the north). Furthermore, the first line, and thus the Metro system for the immediate future, is confined to the western side of the Vistula river, thus doing nothing to ease the traffic on Warsaw's bridges, a major bottleneck between the city centre and the eastern Praga district. Plans for the third line to extend to Okęcie airport have been abandoned for the foreseeable future. Instead, there are plans to use an existing rail line to develop a rail-based rapid transit connection to the airport; no work has yet begun. It is likely that the future extent of the Metro will remain unclear until issues surrounding ownership and future strategy of the PKP, Poland's national railway, are settled. The PKP runs an extensive suburban railway network that could strongly complement the Metro if it were brought up to modern standards. Decades without significant investment mean that ridership is low, despite forecasts that the lines could potentially be profitable and could contribute enormously to improving Warsaw's public transport. Political resistance to restructuring, however, is strong. Furthermore, the future of Warsaw's central railway station is in doubt, which is one reason why the Metro does not go to it. Although built in 1975 it is already in need of what would be an expensive refurbishment, and a mooted new station, possibly next to Centrum or Dworzec Gdański Metro station or connected to a new station on Line 2, would likely be more cost-effective. Similarly, transport planners have suggested that the WKD, Poland's first electric railway, a light rail line that runs to the western suburbs, could be integrated with the city's tram system, or be more closely tied to the Metro and a future suburban rail network, or both. The first such plans were prepared in the late 1930's and the railway tunnel running below the city centre was to be shared by both the railways and the metro. At present the WKD terminates at a station that is at least a five-minute walk or one tram stop from Warsaw's central station, and a ten-minute walk from the nearest Metro stop (it should be noted that before World War II it had a somewhat more central terminus). Although it now has its own management structure, the WKD has yet to be fully modernized, thanks in part due to the lack of a coordinated transport strategy. In the mid-1990's the WKD, PKP and Warsaw Metro systems were temporarily integrated and Warsaw city travel cards were viable also in the suburban railways. This idea was, however, dropped in 1999 due to financial problems.